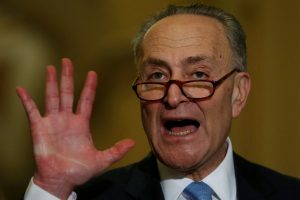 WASHINGTON — Senate Democrats on Tuesday offered a plan to spend $1 trillion on transportation and other infrastructure projects over 10 years, challenging President Donald Trump to join them on an issue where they hope to find common ground. Democrats estimate their plan would create 15 million jobs. The plan includes $210 billion to repair aging roads and bridges and another $200 billion for a “vital infrastructure fund” to pay for a variety of transportation projects of national significance. An example of the types of projects that could be eligible for financing from the fund is the Gateway Program to repair and replace rail lines and tunnels between New York and New Jersey, some of which are over 100 years old and were damaged in Superstorm Sandy in 2012. The project, which would double the number of trains per hour using the tunnels and help enable high-speed Amtrak service, is estimated to cost about $20 billion. Republican leaders, who have said previously that they’re waiting for Trump to offer his own proposal, are unlikely to embrace the Democratic plan. It’s not clear where Democrats would get the money for their proposal. Infrastructure was raised at a meeting Monday between Trump and lawmakers from both parties. Senate Minority leader Chuck Schumer, D-N.Y., said Democrats pitched their plan to Trump and asked for his support. Schumer said he also warned Trump that doing so would mean he’d have to “go against” elements of the Republican Party. Trump acknowledged that and seemed open to working with Democrats, he said. A White House spokesman didn’t immediately reply to a request for comment. Senate Majority leader Mitch McConnell, R-Ky., has said he doesn’t want another infrastructure plan that is effectively an economic stimulus program like the one Congress passed in 2009 at former President Barack Obama’s behest. Democrats “thought that was an area maybe to find common ground, and then Sen. McConnell made the important point it needs to be paid for because we’ve got $20 trillion in debt,” Sen. John Cornyn of Texas, the No. 2 Senate Republican leader, who was at the meeting. Trump bemoaned the state of America’s roads, bridges, airports and railways during the presidential campaign and promised to generate $1 trillion in infrastructure investment, putting people to work in the process. But Trump has offered few specifics. Administration officials have indicated they expect Trump to offer details this spring. Besides transportation, the plan includes money for expanding broadband access in rural areas, water treatment and sewer construction, veterans’ hospitals and schools. A proposal by two of Trump’s financial advisers circulated just after the election calls for using $137 billion in tax credits to generate $1 trillion in private investment in infrastructure projects over 10 years. But investors are typically interested only in projects that have a revenue stream like tolls to produce a profit. Elaine Chao, Trump’s nominee for transportation secretary, told senators last week that she wants to “unleash the potential” of private investors to boost transportation. Charging tolls for roads and bridges is often unpopular. A recent Washington Post poll found that 66 percent of the public opposes granting tax credits to investors who put their money into transportation projects in exchange for the right to charge tolls. Transportation industry lobbying groups want a hike in direct federal spending instead of tax credits. What is needed most, they say, is money to address the growing backlog of maintenance and repair projects, most of which are unsuitable for tolling. An infrastructure bill that relies on tax credits risks providing a windfall to investors and wouldn’t be acceptable to Democrats, Schumer said.